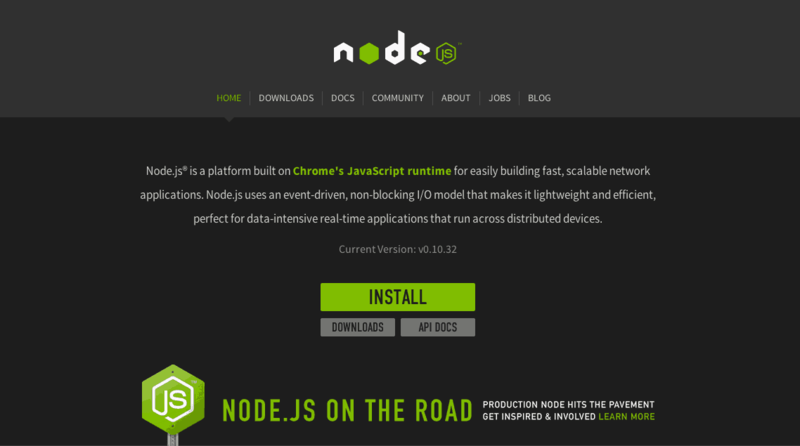 But before you can use Node.js or NPM you need to install them — while the NodeJS website includes an installer, there’s a better way to install them on a Mac. In this article, I’ll take you through the process of installing Node.js and NPM on a Mac using Homebrew. In another article, I’ll show you Windows users how to install them on the Windows operating system. Before you install Node.js and NPM you’ll first need to have some familiarity with the Mac Terminal application. Terminal lets you dig into the underbelly of the operating system and issue text commands to your computer. You’ll need to use Terminal (or a similar application like iTerm) to not only install Node.js but also to use it and NPM. When installing Node via the installer, you have to use the sudo command to make sure it installs properly (there is a workaround for this, but it’s complicated). sudo lets the installer place files in areas of your file system that are only accessible to administrators. One nice thing about Homebrew is that it doesn’t require access to administrator-only areas of your computer in order to install NodeJS (or any other package). This is a safer approach as it makes sure that any package you install with Homebrew can’t wreak havoc on your computer. After installing Node via the installer you have to add the path to the node executable to your system $PATH. This involves mucking around with your shell login file. For experienced Terminal users or Unix-people this isn’t a big deal, but for those new to the command line that step can be daunting. Although the Homebrew method involves installing several different pieces of software, it’s generally just a simple process of point-click-and-wait. It takes a bit longer this way but there’s less room for error. Homebrew is a great tool for web developers. First, it makes removing Node very easy (otherwise you have to crawl through your file system and delete a bunch of files manually). Second, it greatly simplfies the installation of other useful packages like Git, Ruby, or the very useful wget utility. Open the Terminal app and type brew install node. With Node.js and NPM installed you’ll soon be able to take advantage of the huge world of NPM modules that can help with a wide variety of tasks both on the web server and on your desktop (or laptop) machine. The NPM site lists all of the official Node packages making it easy to make the choice. Have fun and check out my current courses at Treehouse. What confuses me is that I have npm all set up in some projects at work and it works fine. However, I just downloaded a new project and when I run “npm -v” in that project, I get “npm: command not found”. I can’t seem to find any docs on installing node per project. They all seem to be global, including this one. So how is it npm works in one project but not another? And if there is a way to install it per project, how is that done? You need node.js and npm installed on your home machine, too. “Command not found” means it’s not installed. Follow the instructions above, and you’ll have everything you need to destroy your free time with work stuff. You need to install NodeJS globally. NPM comes with it and that is how you’re going to be building your project dependancies. Now if you don’t want to install all those packages that your project requires, then you’re going to want to have your JSON file call them up as devDependancies. Take a look at the link below, it might explain it better than I can. I am going to book mark this page. Thanks!! This is one of the best installation tutorials I’ve ever read. If the internet had more documentation like this, my job would be a whole lot easier. Thanks for the great instructions! Thank you so much for such a simplistic and clear guide. Cheers! Thanks so much, ultra clear guide. Would donate a microtransaction if I could! Short and precise. Straight forward . I am getting this error when checking version of npm, any ideas? Thanks, I just used your post to get started! Thank you – this was most helpful ! nicely documented step by step guide! Thanks for the easy to follow tutorial! I’m having difficulties installing homebrew. It keeps asking for a password before it will finish installing. My Mac didn’t have a password and just pressing enter didn’t work. So I created a root password and now I get ‘Sorry, try again’. This is normally the password you use to log into your Mac or your username’s password. You might have your Mac setup to automatically log you in without entering in a password. If you don’t know what the password is to your user account, go to System Preferences -> Users & Groups, and change your password. Then use this password when it prompts you while installing brew. Thank you very much! Is the easiest tutorial I ever followed! this saved me lots of time. thanks! Great tutorial, thanks a lot for sharing this. Wow, thanks! Saved me a ton of time! Its a great piece of article. Works just fine. Keep it up.. Thanks for this great article. Works perfectly! Once you install Homebrew, where is it advised to work on your projects – within the usr/local folder? Awesome worked like a charm. Worked great … very clear, concise, accurate instructions. Many thanks !! Very Useful, Just wanted to say thanks! This is pretty easy to follow thanks man! The process worked seamlessly. Thanks! Installing using brew is not working for me because it needs permission to write to /usr level directories. I cannot run brew as a superuser because it is not allowed. So using brew is not an option to install node on MAC. and installed the node & npm without any problems. I tried to use brew for two days to install and it does not work. Thank you for this, homebrew wasn’t working for me either. Downloading the package from https://nodejs.org/en/download and installing it was much easier than the steps in this article. Took less than 5 minutes to install. Plus it only installs what I need (node and npm) vs stuff I don’t need (homebrew, grunt). Great post. Saved me a lot of time. Dave, thanks for sharing! Thanks, it really helped. 15 minutes job to do the installation. Great tutorial, thanks for the walkthrough. I’d just like to add for other people having a bit of difficulty trying to install homebrew that you need to download Xcode to your machine and run it after it’s installed so that when you run the install for homebrew it can complete. it was so useful for me, but i have a question: where is node installed folder?! where i must make my project? Great easy tute, thank you! All tech documentations should be this good. I am just reading heading to heading and bold words and voila I am done.. I think this tutorial is very informative, but I can’t understand why so many writers ignore the basics of good online communication. Your gray text on a gray background “is” readable, but not without effort. Is this a design decision? Why not make the text black to increase contrast and readability? And, your links, in light blue, are even worse—I cannot read them on my high-resolution 30″ monitor. I am amazed that you ignore these communications basics, when you purport to be a communications company. Not to downplay your experience (I agree web design should be inclusive) but on my monitor and with my eyes, there is a high contrast between shades of gray, white, and blue, and it is easy to read. I must disagree on what you say, because I think that the contrast from background to the typo is just fine. The problem is, if you choose a too strong contrast it will be very difficult for the eyes to read a lot of text. To better understand what I am meaning I advice you to take a piece of paper which is intended for laserprinting/xeroxing. But don’t take the environmental greyish paper but the one that is super white. Now print in the size of 9 to 11 pt some text in a robust font like times, garamond or helvetica. You will see that the words start to flicker in your eyes. Now print the same text on a greyish environmental piece of paper and you will notice that the text will be much more readable and your eyes will not start getting tired that fast. This is due to reduced contrast between text and background. The problem is that in our eyes there is a contrast enriching mechanism working if two adjacted photoreceptor cells are receiving very contrasting amounts of light. The one that receives a lot of light uses up the visual purpur (which is needed for the cells to create the light perceprion) of it’s neighboring photoreceptors thus making the perception of those receptors that receive very little light even darker. And if this contrast just gets to strong our eye is just not capable to handle this contrast any more and the vision gets blurry/flickering. If you look at high quality thread bound reading books without pictures (a novel for example) you will notice that it mostly is printed on natural colored paper and that is not because the printer wanted to save money, in fact this naturally colored paper is way more expensive as the highly bleached super white xerox paper you get at the supermarket. Now look at the contrast between black and white on an average computer screen and you will notice that the contrast is even stronger than on super white copying paper. Therefore it is strongly recommended to either brighten up the typo or dimming down the white of the background (or do both). You can even colour it a bit as long as it does not get too saturated. For graphics issues, it’s important to include the monitor, OS, and so on. I find it restful. No pun intended. Turns out I had installed nodejs and bower previously, and some remnants of that install were blocking the nodejs post-install script. Worked for me too. Thank you John! Hi Igor! As this is an older post, we’d recommend asking your question in the Treehouse Community where our teachers and students are always happy to help! How to uninstall and reinstall node on mac? I think i have some issue with my node 🙁 i want to uninstall the node completely and re-install it once again. I am trying to install nodeJS and I cannot install Xcode on my work computer because I am using OSX 10.9. Can I install NodeJS without Xcode? You should look for an older version of xcode which is compatible with 10.9. I am sure that apple has older versions on it’s server for free download. Outstanding tutorial on node.js et al. I wish I had stumbled upon your site a few weeks ago when I ‘tried’ installing the ‘other’ way. I ended up following your instructions to a “T” after I removed node.js…it worked like a charm. I especially like the fact that I now have Homebrew which I knew existed, just didn’t know the reason why. I’m going to hunt around your site to see what else I can learn. Possibly find a course that i can take as well. Thanks again for the tutorial…I’m off to play in node.js and the like! I’m noticing that whenever I use Homebrew to install Node/NPM, it installs *hundreds* of node modules. So, when I scaffold up a project with Yeoman, the node_modules folder contains hundreds of node modules. I admit I’m not sure if this is Homebrew’s doing, but it seems like it. I disapprove of installing Node via Homebrew. Because many packages are installed using the npm commands. Assign own path of Homebrew for Node and npm, and this is a problem most of the time. To support and at the same time, challenge the idea of installing node via homebrew. I initially did the install via the installer pkg. But I am using a non-admin user to do all my stuffs, developments and so. So I got stuck into even more challenging issues with the permissions. So I decided to remove the packaged install and re-install via homebrew. It went like a charm. I’ve been using npm and node for many things in the last month and installed a bunch of things using npm. Because I used homebrew in the first (well, second actually) place, I can easily uninstall node via homebrew, install nvm via homebrew and install the node versions I need via nvm. Actually, with node, nvm is the the way to go. I had a typo in my first post. It should say ‘Should there be a colon OR slash after that…’ instead of ‘colon FOR slash’. Warning: /usr/local/bin is not in your PATH. Here is my path as displayed from ‘echo $PATH’ (where ‘me’ is my user name). Notice at the end, it shows /usr/local/bin like the warning mentioned. Should there be a colon for slash after that (should there be a slash after every ending folder name)? If this path looks funky, it may be because I was trying to fix a goof from a node-v4.2.1.pkg installation. If there is anything that I should now remove since I am going through the Homebrew installation of Node, please let me know. This was seriously the simplest install I’ve ever done…..of anything. Wow. A similar problem happened with me using Homebrew. Unexpected error occurred during the ‘brew link’ step. But when checking I am getting this. Can someone help me with this. I guess there is some problem with symlink, but not sure how to deal with it. Is there a way to install a specific (previous) version of Node with HomeBrew? Homebrew is a great tool but just installing Node with its installer is much simpler, and sudo shouldn’t be a problem with developers on their development machine. Wish I had read this the day before I installed node instead of the day after. Is there a reliable way to uninstall node and npm from OS X Mavericks if I installed using the NodeJS.org installer? I’ve used the script from here https://gist.github.com/nicerobot/2697848 with success. Hey guys, when are you releasing courses on node ?? Honestly I recommend using the installer on the node.js home page. I use HomeBrew for everything else but I find node to be finicky when installed with HomeBrew. That’s interesting. I’d love to hear about your experience with Homebrew and Node. What problems have you run into? I don’t get it. Why not just install it with the pkg from the nodejs.org website? Seems like this would be less hassle than what the article suggests. 1. When installing Node via the installer, you have to use the sudo command to make sure it installs property. This lets the installer place files in areas of your file system that are only accessible to administrators. One nice thing about Homebrew is that it when it installs packages it doesn’t require access to administrator-only areas of your computer. This is a safer approach as it makes sure that any package you install with Homebrew can’t wreck havoc on your computer. 2. After installing Node via the installer you have to add the path to the node executable to your system $PATH. This involves mucking around with your shell login file. For experience Terminal uses or Unix-people this isn’t a big deal, but for those new to the command line that step can be daunting. Although the Homebrew method involves installing a several different pieces of software, it’s generally just point-click-and-wait. It takes a bit longer this way but there’s less room for error. 3. Homebrew is a great tool for web developers. First, it makes removing Node very easy (otherwise you have to crawl through your file system and delete a bunch of files manually — at least you do at this point). Second, it makes installing other useful packages easy like Git, Ruby, or the very useful wget utility. I’ve updated the article to include these ideas. Thanks for the feedback! Just want to second (or third?) that installing Node, NPM, Mongo, and so on, from Homebrew is preferred for most developer installations. Makes managing versions easier, updating, removing, and so on. Also, the biggest benefit for me is that you don’t need to muck with permissions when running applications, installing packages with NPM, and sometimes even building… Which can require sudo to work properly, something that can get annoying when you’re managing your application’s dependencies.